Also, my Full Guide to Each Way Betting is now complete so you too can get involved in this side hustle and start making some money from betting on the horses! What a roller-coaster of a day. Staked £200.00 in total across 20 horses, came out around £15.00 down for the day, which I’m quite thankful for considering how much was at risk! This game is not the faint of heart but it sure is fun. To anyone reading that is considering this, it’s probably been said elsewhere, but if you can start off with “fun money” and stick with ‘the system’ as outlined in Dan’s guide through thick and thin, it is one hell of a fun hobby. If you tie up money you actually need in the hopes that you’ll grow it, you’ll likely end up playing psychological games with yourself and sabotaging your own results. It’s early days for me yet (Day 4) and already my longest losing run is 7 bets in a row (at £10.00 a time) – however I am still in profit overall by £57.37. Tragic couple of days I have lost £183.16 in two days leaving me with £27.46 profit to show after 8 days of betting. Thanks Dan. I’m very much in this for the long haul with you so will be ploughing on also. Whilst I have started with a larger bank than you did (£1,300) I have the mentality that I’m prepared to lose it all so I’ll keep plodding along. If it wasn’t for your blog and live results feed (which I compare my own results to daily and tend to have very similar results) I wouldn’t be so confident so thanks and hope you keep it going. No bets today Dan? I only ask because I had to miss this morning due to work meetings etc. so I was praying it wasn’t a profitable day after 3 losers in a row for me haha! Hi Rob – Just a handful of bets today but I’ve not updated my sheet yet. I think I had 8 bets total and every single one a loser (not even a place!). So another £100 or so knocked off my November profits. I’ll review at month-end, but may be tempted to park it during December as I’m going to be travelling quite extensively, but we’ll see. I need to refresh the link to my charts as I’ve just uploaded a new template for anyone that wants one (I say template – it has all my bets in), so the charts may have to wait until tomorrow, but no… it was a day of losses and you did well to avoid it. Understandable, life has to take priority! Hope you’ll pick it up again in January. After a fairly uneventful November, the 1st December saw a profit of £238 for me. Great start to the month & most profitable day since starting. Hi Dan – have you changed the times you bet? I’m catching most bets displayed between 09:30 – 12:00 and have lost £50.00 today – how on earth have you hit £134 profit? Nice work though. Same on 3rd December (I think there was like 3 bets displayed between 09:30 – 12:00 that day!). Well, I’m totally baffled. £300+ profit for you today, £10 for me. I’m literally sat there placing bets on everything the software churns out between 09:30 – 12:00 as I can engineer my day to make this possible. I’m not sure what different screen settings would make to what results the software shows? Late Nov I was more or less matching your profit and now you’re leaving me way way behind & I have no idea how. Frustrating for me, but I’m glad you’re results are back on an upward trend. What bookmakers and stakes are you using Rob? 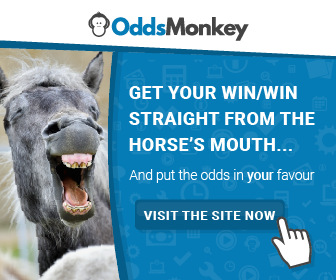 There are 250 or so bookmakers in OddsMonkey so huge variation is possible. I don’t know what else to tell you. I have the OddsMoneky screen on from 9:30 am till lunchtime and I take bets when they come up. I’m betting £14 stakes right now, also doing multiples when the opportunities present themselves. Yesterday was a great day, some big wins and lots of placed horses – first decent day in a while. This betting stuff is very interesting. Seems that it’s possible to actually make a steady profit if you know what you’re doing? Any advice on where to start for a complete “non-better”? Hi Mark – yes steady profits thus far when you zoom out to a month-by-month picture. Day-to-day obviously swings about quite a lot but big picture results are very good indeed. Up another £400 or so this month (December).